The first emoji was created in 1998 or 1999 (there are conflicting reports on the matter) by Japanese designer Shigetaka Kurita, who was at the time working on a mobile internet platform, called i-mode, at Japanese carrier NTT. Kurita was inspired by the way weather forecasts and street signs used simple, but universally recognizable, symbols to convey meaning, and decided to adopt this approach for his project. The first set of emoji was comprised of just 176 pictograms, each with a resolution of 12 x 12 pixels, and was aimed to differentiate i-mode's messaging features from other such services. Ten years ago, again in Japan, emojis debuted for the first time on the iPhone. On November 21, 2008 Apple rolled out iPhone OS 2.2 (yes, that's what it used to be called) to users in Japan, which contained Apple's first emoji font and keyboard. The OS update was released globally, but emojis were limited to Japan only. However, soon after the feature went live, third-party apps soon began including Easter Eggs that unlocked the emoji keyboard for users in other regions. This was not supported or endorsed by Apple, but considering that iPhone OS 2.2 was also when the App Store was first introduced, it was the Wild West of mobile storefronts, so to speak. It wouldn't be until 2010 when emojis were translated into Unicode, thus making them widely available worldwide, and interchangeable between devices, carriers and software platforms. Then, in 2015 the emoji keyboard was enabled for all iOS users by default, which propelled it to become the world's most popular keyboard. 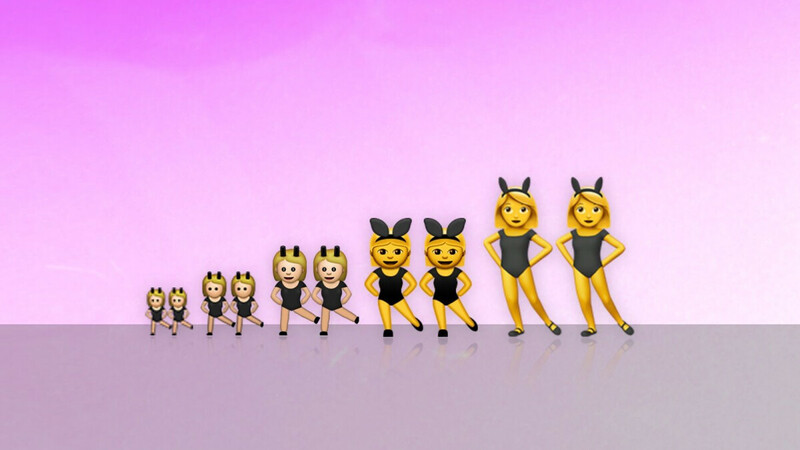 "Over the years, many changes have been made to Apple's emoji set. The total number of emojis has increased from 471 in 2008 to 2,776 in 2018 - many as a result of gender and skin tone support," Emojipedia recounts. 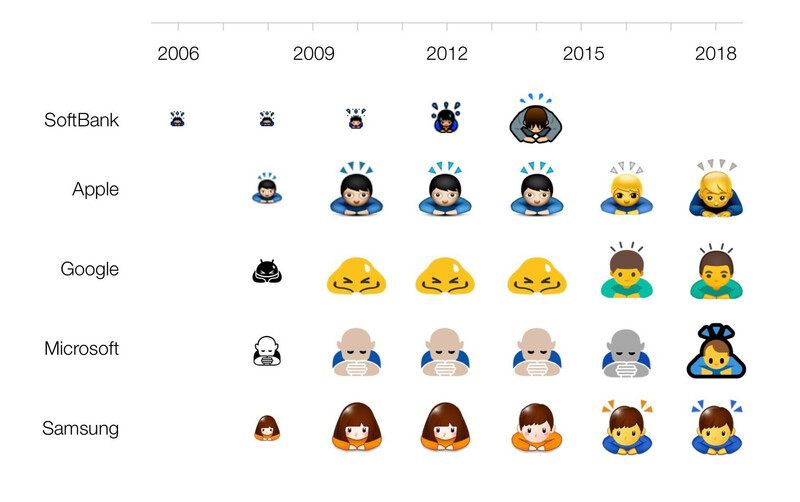 "Some changes have been purely aesthetic (Apple switched to 3D rendered designs in 2016) while others reflected the formal names of emojis when they were added to the Unicode Standard." Funny to think that emojis, which today permeate modern pop culture to uncomfortable levels at times, were a Japan-only thing in the very beginning. Google still makes the ugliest, hands down. The current Emoji from Google are nearly the same as those from Apple. I think you're still looking at years past. I think you’ve never seen Apples emojis, because if you did you’d see how much better they are than the crudely rendered ones from Google. My Note 9’s emojis are virtually indistinguishable from the ones on my Note II, etc. True words baldi. I actually own a Note 9, and a XS Max, and the emojis are basically the same quality, and variety. So iPhones had emojis before Android? Wow! Didn't know that. Yup and the weirdest part is that Google already started petitioning for Emojis to become part of the Unicode consortium in 2007, Apple joined in 2009 and 2010 Unicode finally accepted them. Talking about emojis, when is PhoneArena comment section going to support emojis? Fruit company was not the first to have Emoji's on a phone! No they weren't, but that's not what this article says either. It just kinda tries to make it seem like Apple started the emoji trend, which it really didn't. Anyone who used any well known instant messenger before 2008 knows how much they were already out there. In the years before the iPhone came along Sony Ericsson already offered emojis, but they really only worked if you sent them to another SE user. This is correct but you interpreted it wrong, you should be scared when you type my name.......it will scare the crap out of you! Except Apple didn't trend emojis at all, not even played a significant role in it. That title make it looks like Apple "invent" emojis. Didn't we have emojis back in the day on instant messenger platforms like AOL messenger? Or does PC not count? I just feel like emojis were around a lot longer.